Includes synthetic blend oil. Restrictions may apply. Limit one per customer. Must present coupon at time of service write-up. May not be combined with other discounts or coupons. May not be used on previous purchases. See dealer for details. Expires 04/30/2019. *Limit one per customer. Must present coupon at time of service write-up. Cannot be applied to previous purchases. Restrictions may apply. See dealer for details. Expires 04/30/19. Includes exterior buff, interior carpet scrub and wax. Flush and replace all brake fluid with OEM recommend fluid. Coupon must be presented at time of write-up. Pricing could vary for some makes and models; not valid with any other offer or advertised specials; shop supplies, hazardous waste removal, document retention charge and tax additional. Rotate and Balance all tires. Perform a free multi-point inspection. If you own or are currently driving an Alfa Romeo vehicle, you’re well aware that these are exquisitely crafted and engineered vehicles. It only makes sense then that you want to provide your vehicle with a level of service and maintenance equal to the exacting standards of the Alfa Romeo brand. That’s where we come in to the picture. It’s not an exaggeration to say that we are the experts when it comes to proper care of your Alfa Romeo vehicle. Our technicians are well versed in all mechanical aspects of the Giulia, Stelvio, and 4C models. They can take care of all routine factory maintenance like oil changes, tire rotations, fluid refills, and any other service needed. 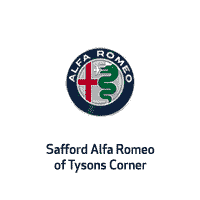 Safford Alfa Romeo of Tysons Corner also realizes that providing top-quality maintenance for your car or SUV can tend to add up over time. That’s why we offer monthly service specials to our customers in order to offset the cost of premium car care. You’ll find Alfa Romeo service coupons posted on our website every month that will help save you money on the maintenance items you need most. If your Alfa Romeo is due for service, consider scheduling an appointment at our Vienna, VA service center. You’ll get the best possible care for your vehicle along with discounted prices on Alfa Romeo maintenance when you choose our dealership. In addition to providing Alfa Romeo service discounts, our service facility obviously only utilizes OEM (Original Equipment Manufacturer) parts when performing maintenance or repair work on your vehicle. When your Alfa Romeo rolled off the assembly line floor, it came with factory designed parts built specifically for your vehicle. These are referred to as OEM parts and they are the same level of parts that we use at our Vienna, VA maintenance facility. Using off-brand or generic parts on your Alfa Romeo may seem like a smart cost-cutting measure, but they can lead to negative repercussions down the road. Why risk using sub-standard parts when you can have top-quality components at low prices at Safford Alfa Romeo of Tysons Corner? Our goal is to provide you with the best parts, service, and experience in the state of Virginia. We realize that consumers have a lot of choices when it comes to where they take their vehicle for service. That’s why we work hard to provide quick, comprehensive, and affordable maintenance for Dulles and Gaithersburg area Alfa Romeo drivers. For your convenience we offer on-site rental and shuttles for our service customers along with an on-site collision center. When you factor in our service and maintenance discounts, it’s clear why more and more luxury auto owners are choosing our Alfa Romeo dealership for all their service needs. We’re conveniently located at 8448 Leesburg Pike in Vienna and ready to take care of all your maintenance needs today.